for maximum output. The Power Station Flex is not considered a portable unit. Are You Ready For Unexpected Power Outages and/or rolling blackouts? 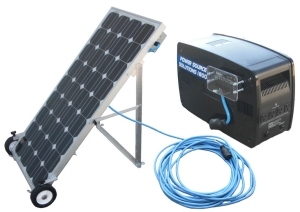 Solar Powered Backup System Provides Instant Electrical Power In Any Outage or Disaster. The Solar generator kit consists of three main components which work together to create a very efficient home power plant. The massive “generator-backup”, the high efficiency solar panel, and the charge controller. In fact, when you compare a solar generator to a gas generator, the difference is pretty remarkable. Here’s why. First, gas generators make an incredible amount of racket… if you can even get them started. Generally the wind breaks the power lines, which get covered with ice and snow. Typically, when you lose power in the cold, you go to the garage, roll out the generator and start pulling the cord. You pull and pull some more, all because your generator has been sitting in the cold and the carburetor is playing hard to get. This is not a lot of fun in the dark. That’s $2,197.00 worth of components (at retail) in this package. Anyone who wants to be prepared… can be, while there is inventory… your price is just $1695.00, plus $150.00 shipping, handling and insurance anywhere in the continental U.S. That is a $500.00 saving. it will be too late to get the items you need. 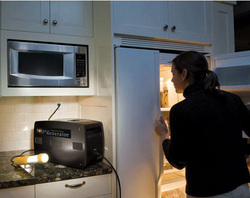 This system has everything you could want in a backup generator. It is quiet, produces no noxious fumes, the power is free, and it is easy to setup and run. Just position your panel for optimal solar exposure, plug in the power cord and plug in your appliances. Light and power in an emergency can make a big difference. If you are one of those individuals who believe that life in this country is going to get much more difficult in the not too distant future, then this unit should be on your list. Imagine the difference in your quality of life if in an emergency, you could have the ability to keep foods cold, maintain cell phones charged for communication and have some light!